Stockport Council is committed to providing apprenticeship opportunities and has put 144 new apprentices into position during 2017/18. During National Apprenticeship Week we are giving one of the apprentices in our digital team a chance to describe their experience. 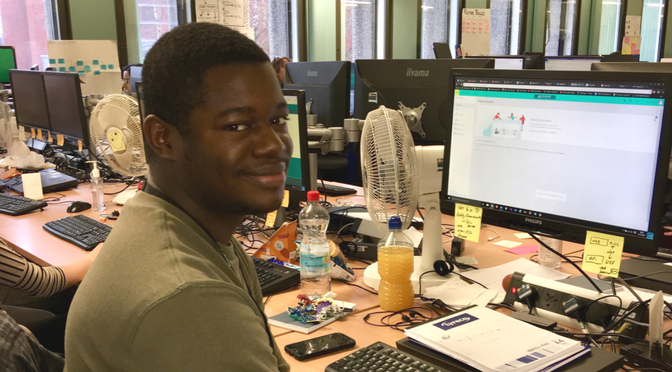 Josh Adesoba is an apprentice developer working within our Digital by Design teams. Josh, who spent his early childhood in New York, moved here from London to start in this role in September 2017, following a year studying Computer Science and a number of jobs within the IT industry. He attends Manchester Metropolitan University one day a week and balances the rest of his assignments and studies around his work commitments, adding that the Council does make allowances for University work commitments. At the end of his four-year degree course, he will graduate with a BSc in Digital and Technology Solutions. Josh will have the opportunity to work with all of the digital teams who are creating Stockport’s new website and digital tools. The apprentices are regularly ‘paired’ with experienced developers to give them the opportunity to work on live projects. He particularly enjoyed his recent experiences working on ‘accessibility’ for online appointment bookings, ensuring that visually impaired residents using screen readers can access our new digital services. Great post 🙂 It is really encouraging to see the input that the apprentices are bringing to the team and how valued and supported they are. Their course and route into the world of IT seems like an absolute winner to me.